These are other products that have gained Scott Welle’s “Seal of Approval.” They are not only outstanding products and outstanding companies – they deliver outstanding RESULTS. Improve your personal fitness results with Hammer Fuels & Energy Drinks. Hammer Gel, HEED, Perpetuem, and more are the foundation for your fitness success! 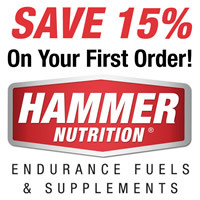 Hammer Nutrition provides products designed to increase athletic performance, from Energy Gels and sports drinks to supplements and energy bars. When you walk, you land on your heels. When you sprint, you land on your toes. An optimal running gait falls somewhere in between. Efficient running is about landing on your sweet spot. Not your heels, not your toes. Newton running encourages running on your midfoot/forefoot. We think of this style as Land, Lever, Lift. After you try it, your running will never be the same.